Rolling sushi at home is quick and easy. Keep your chopsticks ready. Making sushi is all about getting the ingredients in order. First up, is sushi rice, which is typically a sticky, short and fat grain that blends easily with other ingredients. Remember, this forms the base of your roll, so no compromising and substituting it with the kind used in Indian or Italian cooking. Many supermarkets now stock sushi rice, which is a tad expensive but without which the dish is a waste. To begin, cook the sushi rice with vinegar. Sushi vinegar is tougher to find so rice-based vinegar is a good alternative. White vinegar ought to be used only if nothing else is available. The rice should be washed and soaked for a minimum of 30 minutes before you start cooking. Transfer the soaked rice to a saucepan and make sure the water is added in exact measure. For every two cups of rice, add three cups of water. Steam the rice (bring to a boil with the lid on and the flame on medium, and then lower the flame and let the rice cook for approximately 15 minutes) and remove from the flame once the water has evaporated, but make sure it still looks moist. Add three tablespoons of vinegar to this cooked rice. Keep a muslin or cotton cloth over the container and cool. Nori or pressed seaweed is used to roll the sushi. The sheets are usually very large and can be cut in half horizontally. On the rough side of the nori, place the rice using your hands or a wooden spoon. Leave about half an inch at the top of the paper bare. This makes it easier to keep the rice in place, and the rolling becomes simpler. In the centre of the Nori, place the filling. Slices of salmon, tuna with mayonnaise or even avocado (or any other vegetable) with mayonnaise are good fillers. Once placed, press and tightly roll the nori. Keep the surface of the roll slightly moist by dabbing it with a mix of water and vinegar. This keeps the nori from getting chewy. The sushi roll could also be refrigerated for a few minutes to make cutting easier. Once you cut the roll into equal pieces, serve a platter of mixed sushi with pickled ginger, horseradish (which forms the base of the fiery wasabi that sushi is traditionally enjoyed with) and soya sauce. 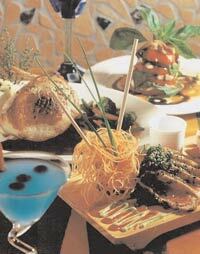 Narendra Singh, executive chef of Hilton Mumbai International Airport tells us how best to pair martinis and kebabs. Martinis are made with gin or vodka and the herb blend of vermouth. Chef Singh says that since the vermouth makes the martinis pungent, pairing it with grilled and barbecued food helps balance flavours and enhance the experience. The delicate flavours of a peach or lychee martini can be paired well with cream-based kebabs like noor-e-murgh or the basil-flavoured murgh ki chaamp. If you would rather opt for a green apple martini or an appletini which has stronger flavours, match its strength with a mustard-based kasundi machhi tikka. An Irish martini is made with dry vermouth and a dash of whisky. This can be complemented by vegetarian kebabs like subz ke shikanmpuri, a North Indian speciality as well as with Lucknow's gulaabi seekh kebabs that melt in the mouth. Finally, a fresh espresso martini prepared with kahlua liqueur, cream de cacao and a cold shot of espresso is refreshing. Enjoy this with textured paneer jaali kebabs and galauti kebabs that bring out its flavours best. .. In-between meals should be eaten every three hours, between lunch and dinner. In a day, you should aim to have at least two to three in-between snacks. It is also advisable to schedule these snacks. For instance, one should be an hour or so after breakfast, the other should be eaten about two hours after lunch, and so on. .. One of the snacks could be a beverage like decaf coffee with skimmed or non-fat milk or a light cup of green, herbal or chamomile tea. Coconut water is also a good filler. .. You could also opt for a snack like a vegetable sandwich. Fat intake should be minimal, so no cheese or butter. Fruit, vegetable salad or even roasted savouries available in the market also make good mid day meals. A glass of buttermilk, a bowl of curd, a piece of grilled chicken or fish, a bowl of salad without dressing and Gujarati snacks like dhokla are also healthy. Try and include a protein supplement in one of three in-between meals. For this, the easiest suggestion is a portion of dry fruits. Try and limit your intake to about five pieces. Fruit slices and vegetable salads could be carried in ziplock bags; stocking dry snacks at work also helps you stay full while eating healthy.